In the previous post on this series of SQL Server Tips we’d looked at Filter Objects SSMS.In this post we’ll look at Object Details SSMS. 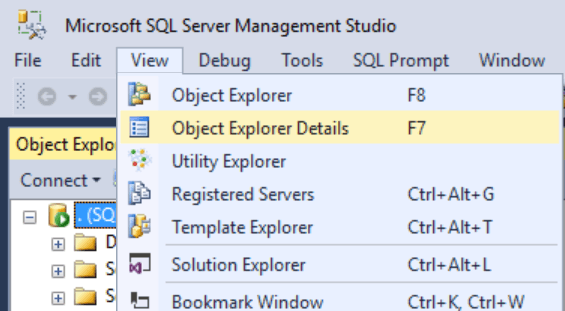 The Object Details SSMS pane can be opened in SSMS using the View menu or by pressing F7. Now we have another pane. Now this doesn’t look that exciting but it gives us more critical functionality, the ability to script out multiple items at once! Whether this be agent jobs, user logins or other objects we can now script out them all at once. The example below shows us scripting out all the logins to a new query window.